During the working meeting that took place on January 28 with the United commissions for Education and Constitutional Issues, the head of the SEP said that the union of these matters is what they call “an integral education”. In addition, he pointed out that if you want a country without violence and a culture of peace, the initiative to reform education presented by the federal government “will create that new Mexican school.” The work is yet to be done, but the law is the framework that will allow us to do it”. He indicated that universality, integrality, equity and excellence as basic postulates of public education are added to the traditional principles of education. 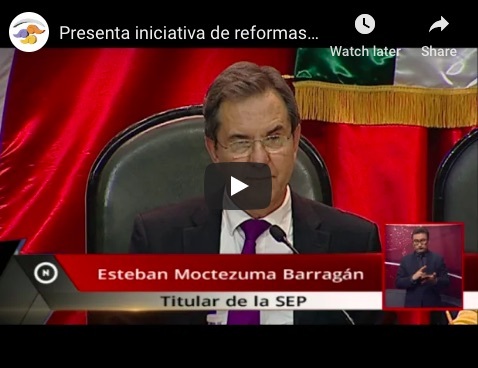 In an interview with Javier Solórzano, Moctezuma said that they will teach English even before the normal teachers learn that language. “Obviously you have to teach English in the normal, but we thought and we have been studying a method, in which through a very powerful platform can enable a teacher who does not know English, to coordinate a group that is working with the platform, “the secretary told Solórzano. He explained that in this way, they could have the ability to teach the language almost immediately, while if “you wait for the normal teachers to learn English” it would take longer to be able to “provide that tool to Mexican children”.